Krow and Wendy are excited to offer Crystal clear studio recordings of “Conversations with Red”. These fascinating discussions with the Council of Elders are recorded monthly, building an ongoing library of Universal knowledge for your further enlightenment and listening pleasure. it's an opportunity for change, in loving balance with the planet. Find out how you can make the transition easier. of the earth plane in the capacity as counsel, as elders. Recorded and pressed in locally owned Passion studio, and mastered in Toronto's Swain Studio, these high quality CDs are approximately 60 minutes in length and are divided into separate tracks, so you may listen at your leisure. In time for your Valentine! 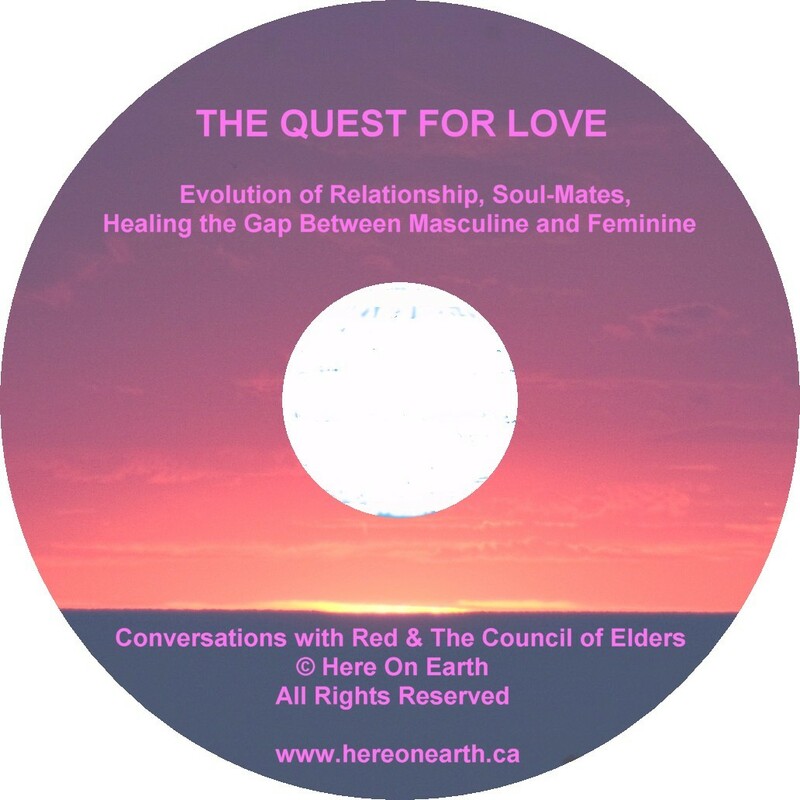 February’s release: A Quest for Love - Evolution of Relationship, Soul Mates, Healing the Gap Between Masculine & Feminine. “ Quest for Love should be mandatory listening for anyone in a relationship,or anyone wanting to be in a relationship.” DC. CDs are $15 each (incl. tax, S&H), or you can order the 2010 monthly series, details at www.hereonearth.ca or www.weaversoflight.ca. We know you will be as excited as we are to share this knowledge and get it out into the world. In an effort to prevent pirating, and cultivate circle community, we ask that you encourage your friends to purchase their own copies to continue supporting our work in creating a vast library of Universal wisdom. Please share this with friends and colleagues who you feel would benefit from these teachings. Thank you! Together we can change the world.